I am starting with one of my most FAVORITE THINGS EVER. This is a necessity on my house...seriously! 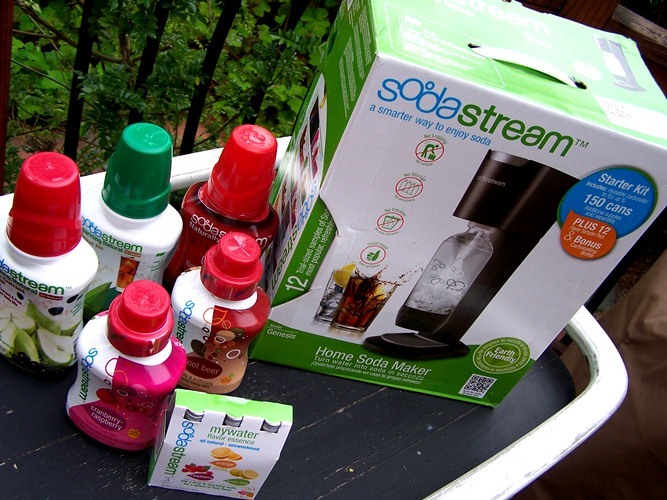 thanks to the awesome people at SodaStream! 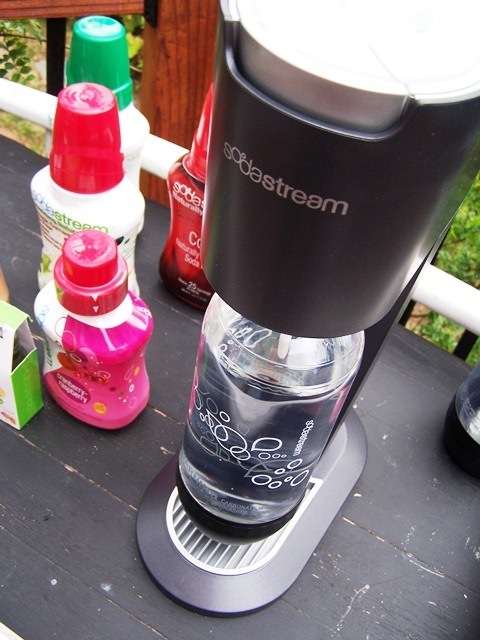 Last year for our wedding anniversary, hubby and I bought a SodaStream. We had been wanting one and figured the time was right! My kids were thrilled...they were fascinated. I wish I could drink soda all day long...but I don't. lots of money when you add it up (and lots of waste too!). and have used it every day since we bought it. We make a bottle of fizzy water every day. but they love it as a treat and they love to make it when we have guests. even including Crystal Light and Country Time flavors. 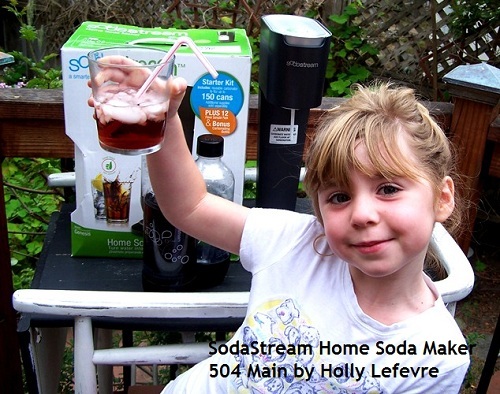 My raves have even convinces many a friend to purchase a SodaStream too! screw the bottle in, push the button to add the carbonation and your favorite soda flavor...and presto you have soda! Just want fizzy water, skip the soda flavor. we are only on our 3rd cartridge. (you exchange it and buy a new one) or order a carbonator kit online. disclosure: I was provided with one SodaStream for review and one for giveaway. 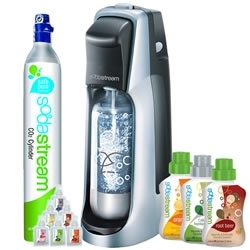 All the gushinng about SodaStream is true and I love it! My daughter and I were just looking at these in Target! I think we'd like to try the Creme Soda first - and then maybe some of the fruit flavors! Lemon Lime! Thanks for the giveaway! I would try the sugar free cola first and then go from there aiming to try ever single flavor and option there is! This is such a great gadget. 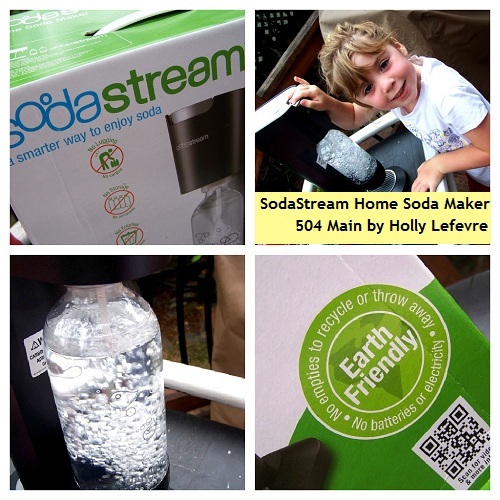 We really don't drink soda here but it could be fun to make your own sodas. We have been thinking of getting one for ages, but have yet to bite the bullet. I've been dying to try one of these! We love to drink tonic at our house. Well the sodamaker looks awesome in the pictures...I believe that it should be useful in reality also...good effort by Holly...keep it up! Sugar free cola and the cherry cola. I have really wanted to try this. 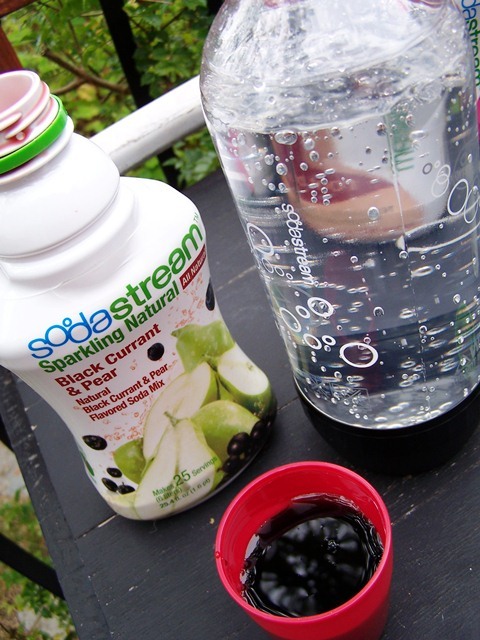 I love cherry flavoring but my favorite use of this would be just to carbonate the water and throw a slice of lime in! I like the idea of flavored waters! I really want to make my own "Orangina" with carbonated orange juice! Saw how much the kids loved it! Have been thinking about getting one...now I could maybe win one. Cool!! Sugar free soda and NO CRV here I come!! Pineapple Grapefruit is the one I'd pick! I want one of these soooo bad! I am a soda junkie so I would use ALL the flavors! I'm also most interested in "fizzy water"! We go through so much of that around here. Also, the pear and black currant sparkling natural sounds really good. Orange Mango, Apple Mango, Pineapple Grapefruit, Orange Pineapple, Green Tea--do I have to pick just one? Thank you so much for this post. 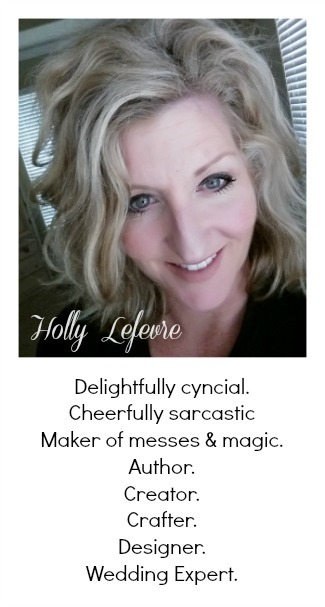 I want to let you know that I posted a link to your blog in Creative Busy Bee Craft Inspirations, under the Page 1 post on Sep. 13, 2012. Thanks again. I have wanted to get one of these to try but wasn't sure if it truly did work or was just a gimic. After reading your post, I'm convinced I need this. My grandkids are always over and expect Nana to have something good to eat and drink ...... so this would be a life saver for me. Pineapple Grapefruit sounds refreshing. Thank you for your post. Black currant and pear...I love Black currant and so may never bother to try anything else...maybe for my kids. LOL. My husband wants to try this with his Ginger Beer recipe to provide the carbonation instead of using the starter. He thinks it would be faster and more consistent. I think I'd like the try the Cherry Cola. It's my favorite soda! I'd love to try the equivalent of Dr. Pepper. The pineapple grapefruit sounds yummy! Any on the flavored fizzy water would be refreshing and yummy! I don't know if I could narrow it down. I would like to try them ALL! We would love to try the Country Lemonade flavor! This so goes on my list as something I want that I didn't realize I needed!! Been thinking about getting one, looks like so much fun, I'm a fan of all thinks bubbly! I've been wanting to try this for so long! I'd definitely try the cola first! There are so many flavors I'd love, but first on my list is lemon lime! I have wanted one of these forever. Would love to try the cola flavor. I would love to try some Fruity Blend! Yes yes YES! Thank you!! I would try cream soda first then lots of those fruity flavors. Awesome! the flavors look so so yummy! LOVE anything with pineapple! Love it! I'd like to try the fruit flavored ones! I'd really like to try this!! I would love to win this.pineapple! Love love love to win this. Any fruit flavor would be nice. Could not publish so I had to enter using Anonymous. I am Darlene Littwin. Would love to have the opportunity to try one of these. With raising two grandkids, it would be nice to not have to lug the two liter bottles around! I want to try all of the crystal light flavours! I want to try Cola. More importantly my husband has been begging for one of these!